In order to view the following files you must have Microsoft Power Point. If you do not already have the FREE viewer, it only takes a few moments to download and install. The FREE viewer may be obtained directly from Microsoft by clicking HERE. Everyone needs to store financial records. In the US, the IRS requires people to maintain their financial records for 3-7 years. Manually storing, finding and organizing financial records is time consuming and has both financial and environmental costs. Organizing home financial, medical, warranty and other house hold papers takes time and space. Children’s crafts and keepsakes fade and are damaged over time making it very difficult to preserve them. And, each year, thousands of homeowners encounter a serious disaster like a flood, fire, or hurricane, most of whom no longer have access to crucial papers and policies once stored in their home…they are gone forever. Retail businesses have large numbers of Purchase Orders (POs). POs are printed and manually filed or are kept on one persons computer. One person typically has access to the files for filing and retrieval. It can take several minutes to request and find PO if the key person is available; longer if not available. Manually managing back orders is time consuming. Storage space continually grows. Many States now require that Petitions for Bankruptcy be filed completely online. All supporting documents must be scanned and uploaded for review by the court; the need for paper documents is quickly becoming a thing of the past. Many Attorneys need to have access to records when attending court and have large record bags of papers they haul from the office to court. 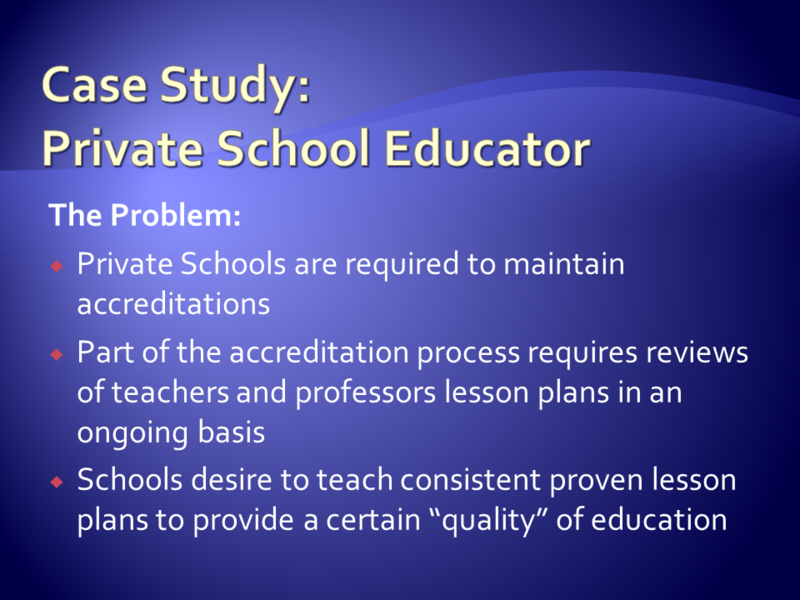 Private Schools are required to maintain accreditations. Part of the accreditation process requires reviews of teachers and professors lesson plans in an ongoing basis. Schools desire to teach consistent proven lesson plans to provide a certain “quality” of education. When an IT consultant is troubleshooting an issue, the consultant needs to reference the user guide and/or specific notes that match the version of hardware or software. A large number of legacy user guides can be difficult to physically maintain and organize and notes can be lost or temporarily misplaced. Many businesses require employees to be drug tested either before hiring or ongoing as a condition of continued employment. These tests and the results must be kept confidential. Outstanding issues must be followed up and completed as the test results are sometimes not delivered to the testing office and request to resend the information are frequent and require manually searching for paperwork.